Huge news for NYCFC today, as the club announces a partnership with Mayor de Blasio, Adidas, and the US Soccer Foundation to grow the game in our community. They will build and maintain fifty soccer fields in underserved neighborhoods of all five boroughs. 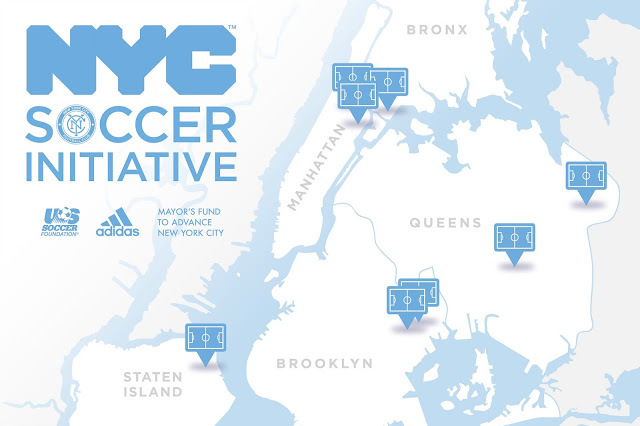 NEW YORK––Mayor Bill de Blasio and the Mayor’s Fund to Advance NYC, the U.S. Soccer Foundation, the New York City Football Club and adidas today announced the launch of the New York City Soccer Initiative, a public-private partnership that will build and maintain 50 soccer fields in underserved neighborhoods across the five boroughs over the next five years. Fields will begin to open for play as early as next year. "The U.S. Soccer Foundation is honored to work with the New York City Football Club, adidas and the City of New York to make a major impact in the City’s five boroughs. The U.S. Soccer Foundation is committed to growing the sport of soccer and using the game as a vehicle to improve health and social outcomes among children in underserved communities. The commitment of strong partners like these underscores the importance of this work and represents a big step toward transforming the landscape in this great city and across the nation,” said Ed Foster-Simeon, President and CEO of the U.S. Soccer Foundation. "This is a special day for the New York City Football Club. Community has been an integral part of this Club since the very beginning," said Jon Patricof, President of New York City Football Club. "We have seen through the work of our extensive community programs that soccer has the ability to change lives. This initiative will give access to pitches and help us deliver our programming to thousands of New York City school kids in every borough, and we are thrilled to be a part of it"
New York City Football Club players, David Villa, Frank Lampard and Jason Hernandez; and Head Coach Patrick Vieira; and Sporting Director Claudio Reyna joined the announcement, which comes with a pledge from all four partners to invest a total of $3 million to build and maintain the fields and provide free programming for New York City school children focused on healthy, active living and mentorship. The program will provide after-school soccer and mentoring programs, such as soccer clinics, festivals and youth summits to promote safe, active and connected communities. The New York City Soccer Initiative will also include a partnership with the City’s Young Men’s Initiative, providing young men of color with mentorship opportunities. Through the construction of these new fields, the New York City Soccer Initiative will aim to connect more young people to soccer, expand U.S. Soccer Foundation’s nationally-recognized soccer after-school program – Soccer for Success ­– and repurpose underutilized spaces in our most underserved neighborhoods, creating a safe, public area where a community can gather. All of the neighborhoods being selected to host the New York City Soccer Initiative fields are focuses of the Mayor’s Building Healthy Communities Initiative, the Parks Department’s Community Parks Initiative or the Young Men’s Initiative. Evidence shows that connecting young people – especially those in the lowest-income communities – to mentorship opportunities early on is directly correlated to future success in high school, college and their careers. The New York City Soccer Initiative supports Mayor de Blasio’s OneNYC goal of ensuring that New Yorkers of all ages can live, work, learn and play in neighborhoods that promote an active and healthy lifestyle. 70 percent have said they now enjoy going to school more. “At New York City Parks, it's our job to make sure that New Yorkers – our children especially – have the chance to get involved in sports and fitness activities. 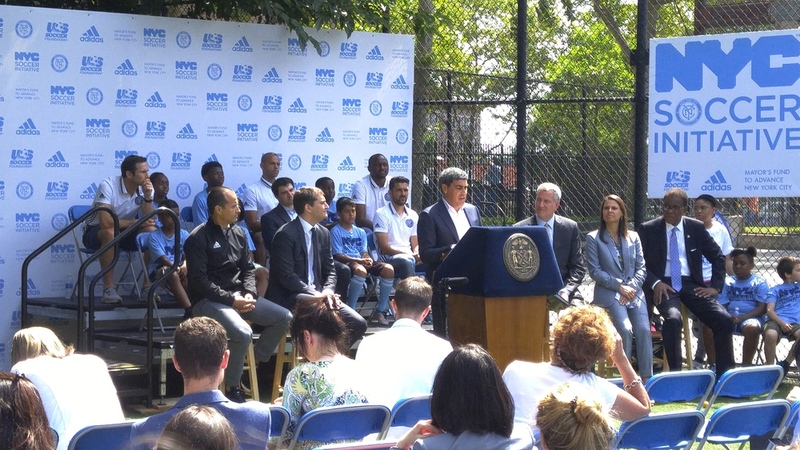 Thanks to the Mayor’s office, the U.S. Soccer Foundation, the New York City Football Club and adidas, those opportunities have now expanded,” said Parks Commissioner Mitchell J. Silver, FAICP. "The Bronx suffers from disproportionately high rates of obesity, asthma, heart disease, and other chronic health issues. This new initiative will play an important role in combating these health disparities by creating state-of-the-art soccer fields that will encourage physical activity and promote healthier living,” said State Senator Jose M. Serrano. Assembly Member Francisco Moya said, "Growing up in Queens, some of my earliest memories are of learning to play football in Flushing Meadows Corona Park. The announcement today of the New York City Soccer Initiative to build new football facilities in underserved communities will give more children in our great city a chance to play the beautiful game. With the growth of football's popularity, as well as the South American population, these pitches will provide greatly needed relief to our current facilities that overwhelmed with use. I applaud the Mayor, the New York City Football Club, adidas, and the U.S. Soccer Foundation for partnering up to provide the kids in communities like mine the chance to make memories that will last a lifetime." Council Member Deborah Rose said, "This public-private New York City Soccer initiative is a welcome investment in my district, an investment that will not only enrich the lives of countless young people, but also the long-term health of our city as a whole"
This is outstanding news not only in its own right, but for what it could represent for the future. The Mayor's office obviously recognizes the role that NYCFC and the sport can play in the community, which can't hurt us when it's time to start talking stadium again.